Marvelous photos, Susie. I don’t know how you have managed to keep that daphne in such good shape. I could never find a place with enough drainage. The daphne surprises me John. There are 3 and they sit a little bit under the eaves of the porch. They’re so nice–give them another try. Lucky you having a hedge with Daphne, they do have the most wonderful perfume. 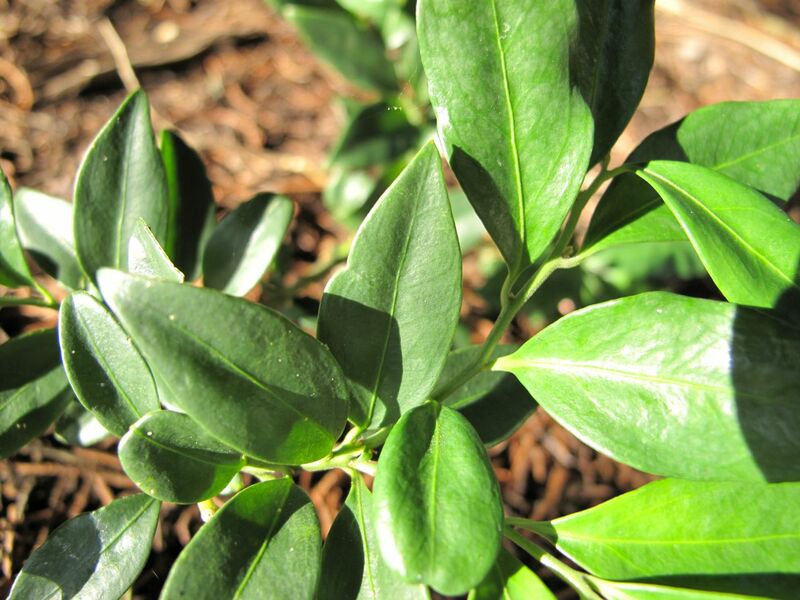 Sarcococca are very slow growing but worth having for the lovely scent in winter, yours looks very healthy. thanks for joining in again this month Susie, it is always interesting to see what plants are growing well for you. The three Daphne were replacements for some Japanese holly lost several years ago due to drought. I thought maybe Daphne would do well there since they don’t like much water. I’m so grateful they’ve been satisfied so far. The beautyberry is just gorgeous. 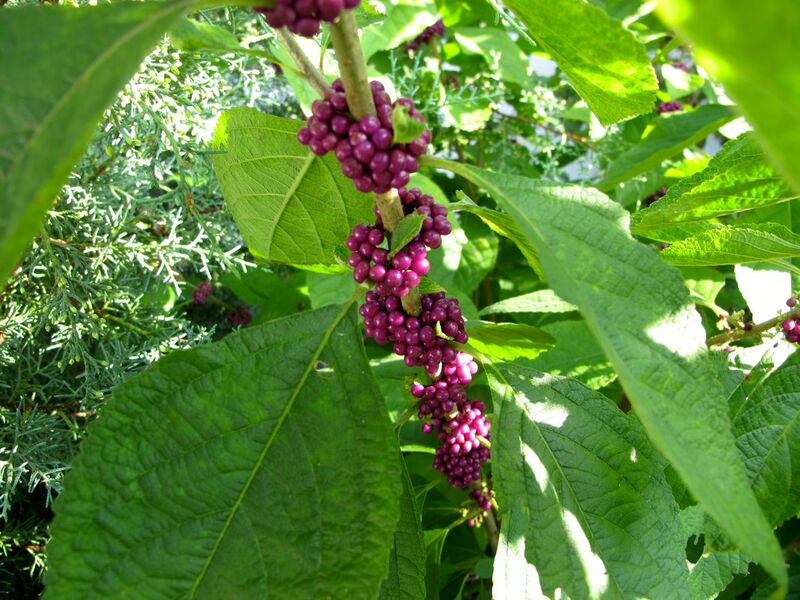 I have the smaller Asian beautyberry, just planted last year. Thanks, the berries are finally turning purple. Actually I must have fallen for the “have to get the native kind” guilt trip but I prefer the Asian ones for sheer beauty. Really? It seems like the native is much showier, but they don’t sell it at garden centers around here. Pretty berries! Is your daphne ahead of schedule? The daphne is way out of line Marian! I think it just reactivated to some of the first cold nights or something. It’s not really in full bloom or anything, but I could smell the fragrance before I went to inspect the shrubs themselves. Your Callicarpa has so many berries, they are such a lovely colour, do the birds like them as well? 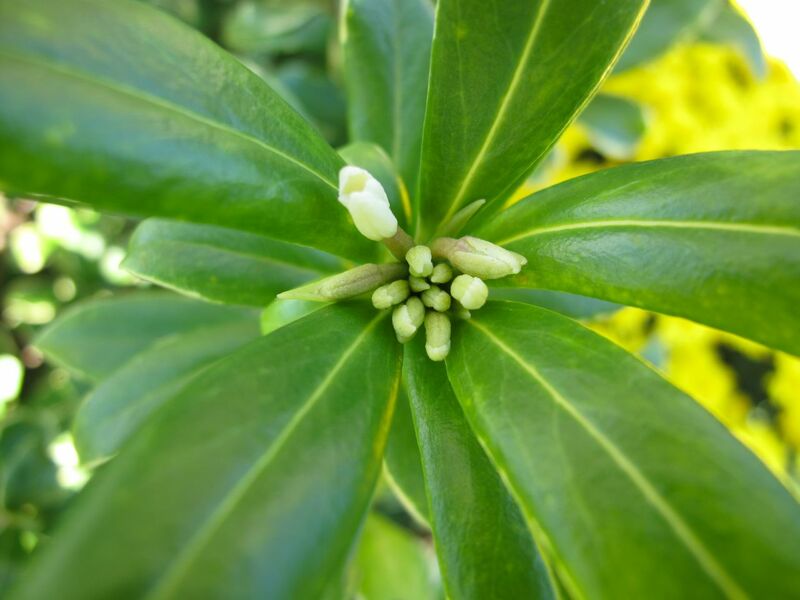 I am amazed to see your Daphne flowers opening up, that is so early surely, here they don’t open until the new year. I think these are just a few errant Daphne blossoms Pauline. It should open in early winter. Today was the first garden club meeting of the new year and our speaker’s topic was “Plants for Birds”. I was happy to see a photo of Callicarpa berries as a recommended food source for currently migrating Gray Catbirds, so we’re right on schedule. Your foliage all looks so healthy! 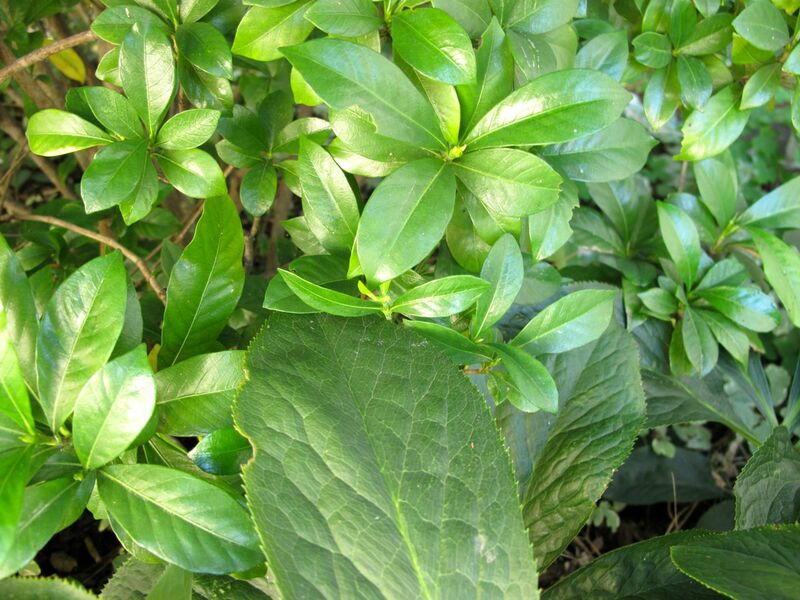 Lots of glossy leaves too. My hellebore is sending up new leaves so I can cut back the ugly scorched ones now. Love that grass – I’ve been looking for some Pink Muhly Grass for some time here, but no luck yet. Cathy, I’m always attracted to glossy leaves. 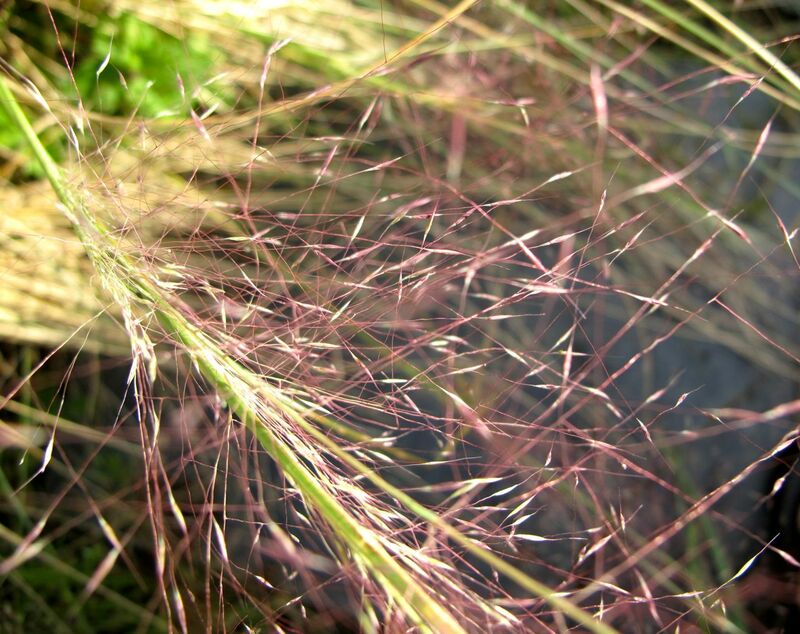 Hope you can find the Pink Muhly Grass. There is a White Muhly Grass now also and the two colors look great together en masse. Last year I saw a fabulous planting in town. My Muehlenbergia is just starting to flower and I can’t wait as it’s the first time I’m growing this grass. The aquilegia is delightful and so is the callicarpa which I cannot seem to find here. Lovely berries! Annette, hope you enjoy your Muhlenbergia. Mine is not in a well-chosen location and usually flops, but this year it’s nice. Did you know there’s a white version also? They make a great combination. The callicarpa is nice food for the birds. No, I didn’t…white foliage that is or flowers? Muhlenbergia capillaris ‘White Cloud’ has white inflorescence. There is a gorgeous mass planting near a highway in town that using both the white and the pink. Here’s an image of a similar use. What a beautiful Callicarpa! So full of berries. I am amazed that your Daphnes are starting already. The Callicarpa was planted many years ago but became lost under a more fast-growing tree. The tree had to be removed a couple of years ago and the Callicarpa has thrived in the resulting sunlight. The daphnes need to wait until early winter and I hope they get the message to be patient. Nice you have such an interesting collection of shiny, deep green leaves. It’s one of the things I always associate with southern gardens, and one which I don’t get enough of up here in the cold North! Thanks! 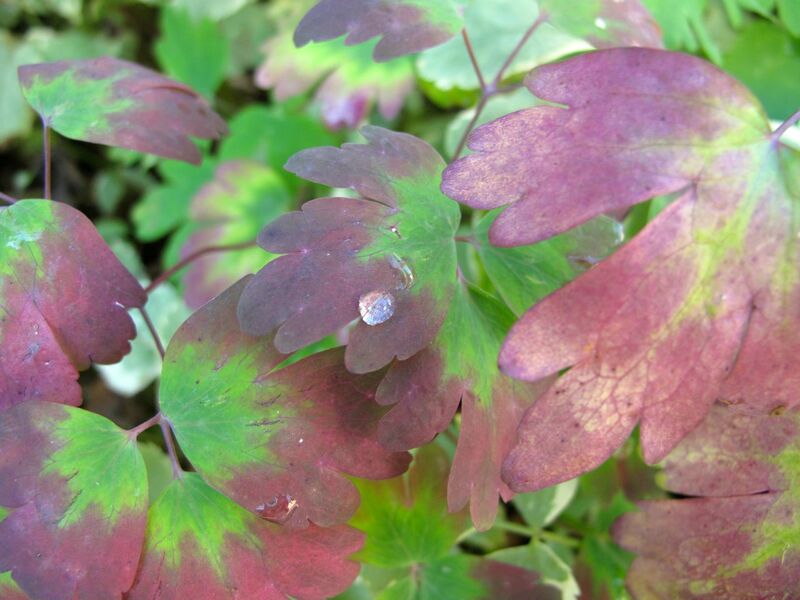 Maybe shiny, dark green leaves help offset the harsh sun–I don’t know, but I love them. I hadn’t thought about them not being as easy to have up North. Thanks Beth. It’s nice we can extend our gardens through sharing our blogs. Lovely foliage and a bit of color shifting now…here we are well on into fall. 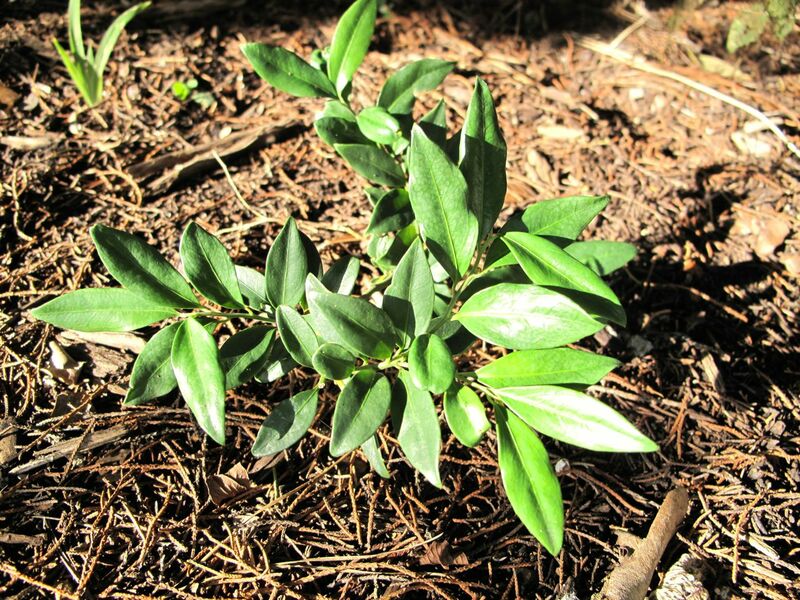 I tried to grow Sarcococca ruscifolia but it took forever and I had it in full shade…not sure where it went but eventually it was gone. Thanks Donna. I don’t know if the Sarcococca is in a good spot or not, it’s under a tree because that’s the only shade I have. It’s supposed to smell lovely though if and when it blooms.